We are coming up on the longest economic expansion in recorded history, which means we should all be acutely aware of anything that might derail it. The permabull will tell you that economic expansions don’t die from old age, but that doesn’t change the fact that their lifespan is almost always shorter than the economic expansion we are in now. Below are some indicators that I believe are clearly signaling the end of the business cycle. Short-term interest rates have been rising sharply over the past couple of years, and that is making it more difficult for borrowers to pay off their credit cards. 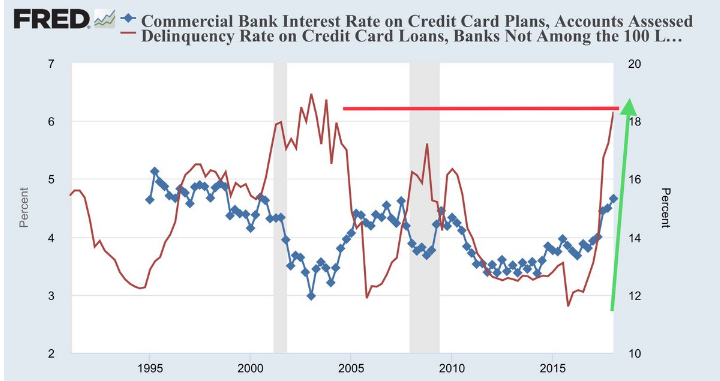 As you can see from the chart above, as interest rates on credit cards have risen in the past, so has the delinquency rate. Now, the delinquency rate has skyrocketed as is common before a recession. The above chart was recently posted on Twitter by David Rosenberg, the Chief Economist and Strategist at Gluskin Sheff. 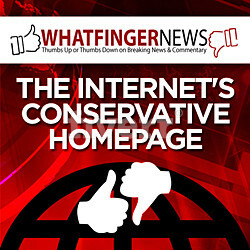 It measures the gap between consumer confidence of the present and future. Its peak means that there is likely no more pent-up demand by consumers. As you can see, recessions are preceded by a sharp peak in this metric. Have we reached another peak? The Leading Economic Index (LEI) is a metric used to measure the peaks and troughs of the business cycle. It is a composite of 10 different components. Some of the components include average weekly earnings from manufacturing, building permits for new housing units, stock prices and an interest rate spread. For more information on the LEI, check out the website. 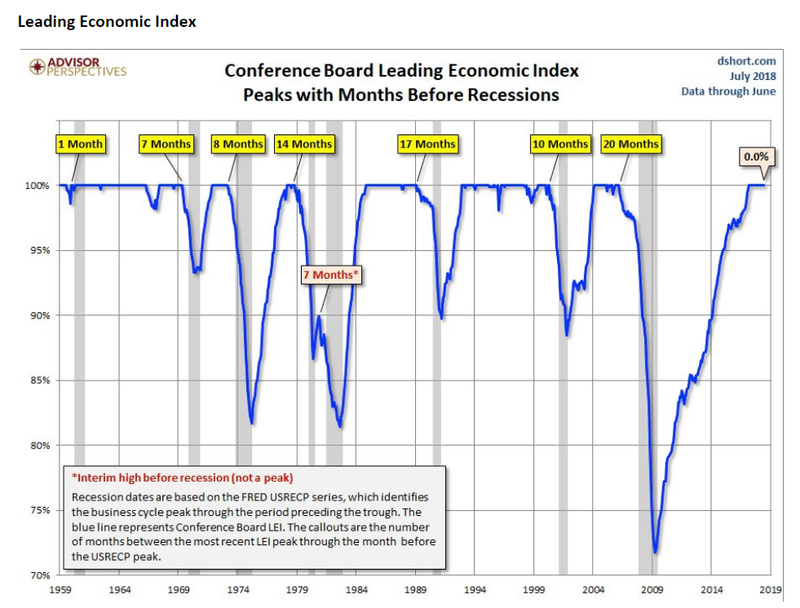 The LEI will typically signal the end of the business cycle by peaking about 7 months before a recession on average. However, as you can see from the chart, it has taken as long as 20 months. But the LEI has undoubtedly peaked. Mergers and Acquisitions volume typically spikes before a recession. 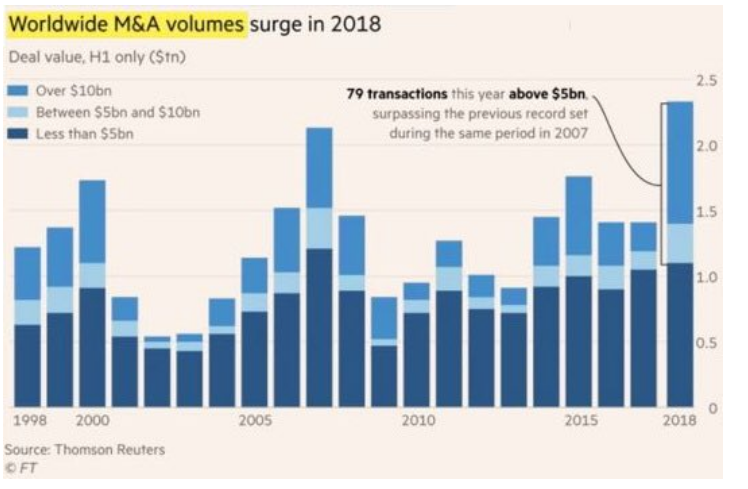 As you can see from the image above, 2018 M&A volume has surpassed the level reached in 2007. This may indicate that companies are feeling the exuberance that the rest of the market is experiencing, which is typical before recession. Or this may mean that companies are starting to feel the squeeze of a stagnating economy, and thus need to restructure their companies to cut costs. There is still some debate on exactly why this metric peaks before a recession. But one this is clear: M&A is peaking and that spells trouble for the economy. It is incredibly difficult to predict the end of the business cycle. No metric alone can paint a detailed enough picture, so they must be used simultaneously. In fact, these four metrics alone probably won’t paint an accurate enough picture either. I will be writing about more of these metrics in the coming months to keep you all aware of the deteriorating health of this business cycle. Before you make any significant changes to your portfolio, please do your own research and/or consult a financial professional.